Fueled by the need to explore, Black Project is pushing boundaries at every turn. James questions everything. He sees things in a way most adults have forgotten how to. Guided by the questions "why?" and "what if?" - it's this characteristic that has propelled Black Project into the elite of wild and sour beer breweries. As the name suggests, Black Project ferments its beers on spontaneous and wild caught microbes - always. Even their IPA is fermented on a foraged Saccharomyces strain from an apple tree in James' neighborhood. The beers are wonderfully beautiful and display terroir in a playful way. The complex and thought provoking beers coming out of the brewery are a beer geek's dream; yet, they are approachable enough for a novice to enjoy. Honestly, go find some now. As craft beer continues to evolve, it will breweries like Black Project and people like James and his wife Sarah who will force evolution and encourage exploration. They'll lead by example, never take no for an answer, and always ask "why?" We hope you enjoy our chat. 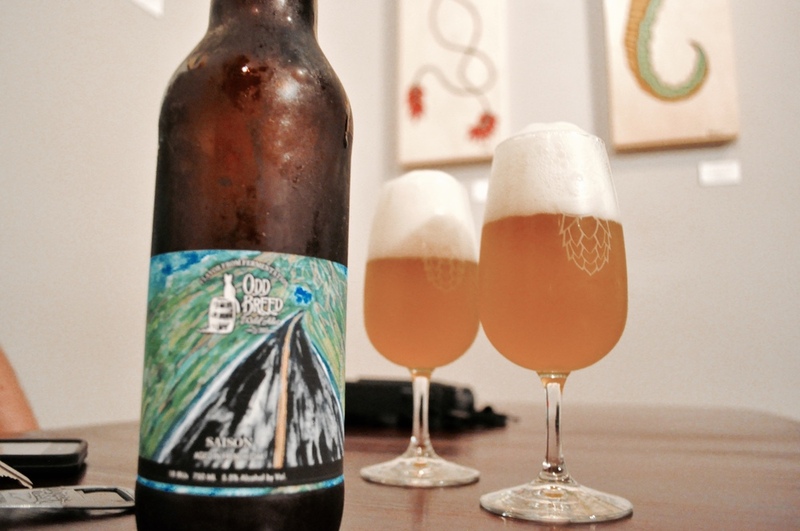 When art and science collide, you get Crooked Stave. It's a delicate balance between creativity, exploration, precision, and hyper technical attention to detail that sets Chad Yakobsen's beautiful project apart from the pack. Chad, if you didn't know, is an expert on all things brettanomyces. He's written a dissertation on it, he's brewed countless beers with it, and he's quite frankly, one of the most proficient users of wild yeast and bacteria in the country. If you couldn't tell - I am in love with his brewery and have the utmost respect for what he's able to produce there on a consistent basis. On a personal level, the brewery is inspirational and thought provoking - but on a global scale, Crooked Stave is incredibly important to the wild and sour beer industry, as they put their phenomenal beers on shelves across the country and pushing the styles forward into the mainstream for all to enjoy. Sit back, relax, and enjoy our chat. You even get a small tour of Chad's house in the process! The Rare Barrel has become one of the country's foremost producers of sour beer. That's no surprise if you've had the opportunity to try their beer - it's clean but just funky enough, it's purposeful, and the fruited offerings beautifully display all of the best in the fruits they use. Batch after batch, The Rare Barrel is consistently impressing thanks to their willingness to dump bad beer and only use the best their massive barrel collection has to offer. Just last year, the brewery dumped 25% of its stock because of a fluke off flavor that just wouldn't go away. Rather than attempt to blend away this imperfection, the guys decided that to live up to their standard the only viable option was to dump. And dump they did. Hundreds of gallons of beer were poured down the drain. Doing things like this ensures that when anyone walks in to the brewery they are going to love what is poured in to their glass or is in the bottle they are taking home. Even more importantly, it protects and furthers the cause which is sour beer by providing quality and consistency with a style that is only now in its infancy here in the states. Please enjoy our chat (even the "interlude") and grab some Rare Barrel to drink while you do! Karl Volstad & Evan Miller - Founders Civil Society Brewing Co.
Hops are king at Civil Society. They stand front and center, grab your attention, and satisfy your craving for those tropical juice bombs hop heads have come to love. While they've built a strong following for their hoppy beers, the rest of the offerings on the menu are well made, balanced, and just as exciting. The trio of founders never worked in a professional brewery before opening Civil Society. Karl homebrewed among other things, Evan worked on yachts, lost at sea for months at a time, and Chris, pitched in the major leagues, spending time with the Marlins. Yet, even with no professional brewing experience, the group brought the required skills to run a successful brewery to the table. Lots of brewing experience and a seafaring fixer ready to tackle the day to day set up and mechanical issues most brewers have to pay someone to figure out. Even more important, they have a thirst for knowledge and perfection that is the driving force behind their brewery. Beers like Fresh, brewed over and over, making seemingly minor improvements each time, each one leading to a higher quality product. It's that kind of attention to detail that is bringing the early success that the brewery is enjoying and will continue to ensure their growth in the industry. Find their beer but first enjoy our chat! Homebrewing and small scale experimentation is pushing the envelope in brewing. The lack of a production schedule and a required consistent core line-up allows small scale non-professional brewers and some pro brewers to explore technique, develop styles, and go out and find yeast cultures that most pro brewers don't have the time or ability to play with. Jeff is one of those homebrewers turned "yeast wizard" that is pushing beer forward. Culturing wild yeast, working to catalog yeast in every zip code and internationally, and most importantly, reminding brewers to constantly evolve and learn. He's a steward of the craft and for all the right reasons. This chat was fun and insightful but most of all, inspirational. Jeff was a reminder of why craft beer has become such a large part of our lives and why we're excited to see what breweries that make the time and space for exploration in yeast and fermentation are going to come up with next. If you brew, check out Jeff's site. Buy the yeast wrangling kit. Buy one his proprietary cultures. Brew a beer completely unique to yourself. Contribute to his project and be a part of brewing history. Most of all, explore the craft - the sky's the limit. Barrelworks wasn't a goal of Firestone's ownership and it wasn't necessarily a welcome guest at the brewery either. The beautiful beers coming out of Buellton today come to us as a result of lots of hard work and a little bit of sneaking around on the part of Jim Crooks, now the master blender of what was almost a scrapped project. Thankfully his perseverance with the project and constant curiosity about the processes at work inside of his small collection of barrels led to a full time and recognized piece of the Firestone Walker brand. A piece of the brand that is only getting bigger and better. Off on their island one hour and one half south of the Paso Robles facility, Barrelworks is exploring the realm of wild beer. No concerns about infecting any clean beers, no limits or boundaries, and full control over the production of the wildly complex (pun intended) ales leaving the facility on liberation days. With Jim at the helm, the crew is producing some of the most beautifully nuanced and complex beers around. Beer that give the most curious drinker something to think about while giving the novice craft beer and wild ale drinker a wonderfully balanced introduction to what wild ales should and can smell, taste, and feel like. Honestly. The beers are beautiful. The people are awesome. Jim is no exception. Listen in on our chat about all things Barrelworks, wild beer, and attempting to produce beers like these at home. When you think about breweries who exemplify quality, consistency, complexity, and balance, few meet the standard set by Firestone Walker. From Brewmaster Matt Brynaldson on down, the team is committed to achieving the perfect beer every single time. While Firestone Walker certainly made a name for itself in Paso Robles and around the world for its clean, straightforward approach to saccharomyces fermented ales (and maybe some of you have heard of Pivo Pils), Barrelworks, about 90 miles South in Buellton is bringing Firestone back to its original location to brew old world wild ales. That project, which in a few short years has already become a major success, is led by Jeffers Richardson, its Director, who was hand-picked to come back and lead the charge on this new venture. Along with his team, including master blender Jim Crooks "Sour Jim", Barrelworks is producing some of the most complex and balanced wild ales in the country, if not the world. Jeffers was Firestone Walker's first brewmaster, Barrelworks is located in Firestone's original location, and the emphasis for the project is on going back in time to recreate and expand upon old world wild beers - everything is coming full circle. As the program continues to grow, a coolship and more foeders are in the works. And guess what? That merger with Duvel isn't changing things for the brewery, at least not in a bad way. Duvel brings a like-minded approach to beer and affords the team the ability to continue to grow and serve you more of this incredibly high-quality beer. So quit the trolling. Things are looking up. Barrelworks is leading Firestone in to a new era. Sit back and enjoy it. Fresh off the silver medal at the 2015 Great American Beer Festival, Blackberry is only looking forward. Paying respect to the past while pushing the boundaries into the future. Up to now, a beautiful Belgian inspired saison has been king at Blackberry, with variations available for each season. The Summer variant being the recent GABF winner. Inspired by Belgium but ultimately inspired by the brewery's home in the mountains of Tennessee. To call the farm beautiful is an understatement. One look at the green fields tucked in below wooded mountain sides and you're taken away to another time. A simpler time. Only, at Blackberry, the farmhouses are home to James Beard award winning restaurants, and now a brewery that produces beers rooted in that simplicity and beauty that make Blackberry such a wonderful place. Daniel became the head brewer at Blackberry after spending time brewing in Utah and Michigan and brought a wealth of knowledge with him to Tennessee to brew Belgian inspired beers in a brewery custom made to mimic the Belgian breweries the team at Blackberry admires. Beer is an experience. Your surroundings often times influencing your impression of the liquid in the glass. At Blackberry, the surroundings are a great start to that initial impression. Fortunately, the beers follow through from start to finish. Beautiful in the glass - complex yet approachable on your palate - wonderful with food. We hope you enjoy this conversation as much as we did. Matt Weintraub & Moh Saade - The Tank Brewing Co. I've known these guys for years. I've had an opportunity to taste through their beers since before The Tank was even a thought. I've watched them meticulously work through technique and recipe composition, test glassware's effect on their recipes, experiment with pH levels, test temperature's effect on hops, and other things nobody cares to hear about. My point is, these guys have worked hard on every aspect of their brewing for years - they're ready for this. After chatting about what's in store, the future looks good for Florida beer. After tasting what's in store, the future looks even better. I love a brewery that leads with a saison. "La Finca Miami", which translates to "The Farm Miami" saison is the flagship for the brewery and sets the standard for what you can expect from the rest of their offerings. Dry, slightly tart, yeast forward, citrus, and a nice foamy head, a beautiful beer from start to finish. It's also a great representation of what you can expect to find in most, if not all of The Tank's offerings, a clean, dry, crisp finish - achieving complexity and drinkability. That dryness is their calling card and it allows their flavors to shine. Flavors achieved through quality ingredients treated with care. Like other great breweries, a no nonsense and straight forward approach leads to fantastic beers, no matter what the name of the hop used in their IPA is. Flavor is flavor. Quality is quality. That's exactly what they're after. We hope you enjoy the chat. This is a project that I am excited about. Make no doubt about it, Odd Breed will elevate the craft beer scene in Florida and in my opinion has already begun to do so. Matt Manthe and his beer, has already been coined the "Crooked Stave" of Florida because of his knowledge of and ability to use and control wild yeast to create delicate and flavorful beers through fermentation. It's only fitting that Odd Breed's slogan is "Flavor through Fermentation". Using the knowledge and experience gained while brewing in Germany and back in the states at Thomas Creek, Matt is creating some of the most beautiful beers I've had the pleasure of tasting. Crisp, refreshing, dry, and full of flavor - the beers go great alone or with the most delicate of foods. Odd Breed's process is unique as well. All of Odd Breed's beers will see oak and will contain one or more different wild yeast strains. The process lends itself to the complexity found in the beers and helps with the signature house character that Matt has been able to develop. In the conversation we talk a little about Matt's history in beer, take a little glimpse into the future of Odd Breed, and talk about Matt's inspiration behind these great beers. Plus, we asked Matt to clear up some of the common questions surrounding just what a wild ale is - his answers are at the bottom of the page. CC - There is a lot of confusion out there as to what makes a beer a "wild ale." Can you help clear that up? MM - Probably not! Brewers and consumers will be disagreeing about this specific terminology for a long time. I like to define wild beers in simpler terms, so to me, a wild ale is a beer that is fermented, at least in part, by yeast that does not belong to the genus Saccharomyces. This definition is more broad and encompassing than what some other brewers ascribe to, but I think the flavor of the beer should be the defining factor that differentiates wild beer from other beer styles. Brettanomyces is the most common type of yeast used in the production of wild beers, but other less common yeast strains are sometimes used as well and bacteria may or may not be included. I think it is important to differentiate wild beers from spontaneous beers. I would argue that all so-called spontaneous beers (particularly those that use a koelschip - like traditional lambic) are wild beer, but not all wild beer is spontaneous. Surprising to some, Lambic is not a product of 100% spontaneous fermentation. Lambic brewers achieve reasonable consistency not just from blending their beers, but also from reusing established barrels that act as an inoculant, delivering some of the same strains of yeast and bacteria into the ferment. Some brewers define a "wild ale" as a beer that is fermented with microbes not cultured in a lab; while I would certainly say that such a beer could be considered a "wild ale", I think the definition is too limiting. I reuse my strains and store them in my 'lab fridge' but I wouldn't say the strains become any less wild after I harvest them, propagate them, and then use them in another ferment. The definition of a "wild ale" with regard to process is something brewers will continue to disagree about - to me it is easier to recognize a wild ale when I taste it. There are a host of flavors produced in wild ales that simply cannot be produced in typical beers that are fermented with Saccharomyces. CC - What is being referred to as a sour? Is every wild ale a "sour"? MM - Absolutely not. In my opinion, wild ales do not need to have bacteria, though there are many wild ales that do in addition to non-Saccharomyces yeast. Brettanomyces produces very small amounts of acetic acid, but not typically enough to make a beer taste sour. I make farmhouse IPAs and 100% brettanomyces fermented beers that are usually very hoppy. The hops in these beers prevent any significant amount of acidity from developing, even if Lactobacillus and Pediococcus are present, as is the case for the mixed culture I use in my farmhouse IPAs. These beers typically have a pH of about 4.1-4.2 (4.3-4.8 is more common in normal ales and lagers) and they have a slight amount of tartness, but they are far more bitter than tart. To me, sour is a tactile quality. Yes, it is one of the four basic tastes, but it has more implications for mouthfeel than flavor. I don't want people to refer to my beers as 'sours'. They are so much more than that. Calling them 'sours' seems to imply that acidity is the end goal. I make beers that highlight the various flavors produced by the non-conventional yeast known as Brettanomyces. Many of my beers have some degree of acidity and some of my beers are quite tart, but the acidity present in my beer plays a supporting role to balance unique flavors and create structure. Making a nuanced, subtle, balanced, and complex beer is always my end goal; making the most sour beer possible is as futile as trying to make the most bitter IPA or the sweetest milk stout. There are some beers out there that have acidity, usually from Lactobacillus bacteria, yet do not contain any non-saccharomyces yeast. These beers are typically (but not always) produced with a process known as "kettle souring." I think these beers are quite boring and one-dimensional, and I'm not sure what they should be called. Perhaps calling these beers 'sours' would be appropriate, since they are not wild and acidity is often the main goal in producing these styles. CC - I'd like to clear up the difference between Lacto and Brett. What different flavors are achieved by their use and what effects do they have on the beer? MM - Lacto and Brett are completely different. Lactobacillus is a type of bacteria, while Brettanomyces is a type of yeast. Genetically speaking, that is very significant because the genome for Brett is about 10 times larger than Lacto. From a fermentation standpoint. that means that Brett can produce far more flavor compounds in the form of esters, phenols, and different types of organic acids. Lax strains differ in their production of types of organic acids and minimal esters, but Lacto mainly produces lactic acid, which is responsible for lowering the pH and increasing the sensation of acidity. Lacto is generally a quick fermenter, prefers simple sugars, and cannot ferment a beer to completion on its own. Brett can be a very slow fermenter and can ferment larger more complex sugars for up to a few years, often consuming all sugar in a beer. If you want to make a low carb beer, Brett would be an excellent yeast and would certainly result in a beer with far more character than the typical American light lager! There is more genetic diversity among different species and different strains of Brett than among different strains of Lacto. I'm currently working with 16 different strains of Brett, some of them incredibly different. Some produce very fruity, tropical flavors; those tend to be my favorite strains. However, some produce interesting aromatics and flavors like cherry pie, wet hay, musty lemon, barnyard, and smoke - those flavors can work nicely when balanced with less assertive flavors. However, it is important note that there has been limited research on Brett and Lacto with respect to their flavor implications in beer, and my experience is anecdotal. Most research on these microbes has been focused on preventing their inclusion in products from large breweries and wineries where they are viewed as spoilage microorganisms. Coaxing different strains of non-traditional yeast and bacteria to produce unique and unusual flavors is one of my goals at Odd Breed, and it is from that goal that we define our beers as a product of Flavor from Fermentation. Florida craft beer has been facing an uphill battle in Tallahassee over the past couple years as the market share being taken over by craft beer continues to grow. Large breweries and distributors have used longstanding political influence to do what they can to stunt the growth of this craft beer boom. Sadly, rather than evolve and grow, these dinosaurs are trying to legislate out the competition. This is about as un-American as it comes. This can not be tolerated. This must be fought. Breweries like Cigar City, Florida's craft beer leaders, have learned very quickly that the challenge is a real one. Millions of dollars are being funneled into the attack by big beer and age-old relationships between big beer and the legislature have forced the young craft beer industry to grow up quickly. A real life David and Goliath is unfolding right before our eyes here in Florida. David, armed with integrity, innovation, and the support of a generation seems poised to ensure the outcome remains the same as it did in the age old story. Just look at the growth in the last 5 years. Look at the movement and the way our generation has embraced craft beer. It's not a coincidence and it's not a surprise. Cigar City has been the catalyst for economic growth for the bay area and the state, has employed hundreds of local people, has increased tourism in a state that prides itself on it, and among other things, has become a source of pride for many Floridians. Through hard work and dedication, Cigar City is leading by example and paving the way for the other breweries who have opened and will open in the coming years. The legislature needs to see what a great industry ours is and what a benefit to Florida helping craft beer along can be. I think they are. I know they will. Florida craft beer is here to stay. Luke Dickinson - Founder/Brewer Wicked Weed Brewing Co.
"A wicked and pernicious weed"
In one of the best beer towns in the country, Wicked Weed is producing some of the best beers available in America. Aggressively hopped west-coast style IPAs and wonderfully complex and balanced sour ales have brought the brewery world-wide acclaim and allowed Wicked Weed begin expansion into a 5 million dollar facility which will have a 50,000 bbl per year capabilities. In just over two years, Wicked Weed has become the #2 tourist attraction in Asheville, NC, a statistic that Luke is still in disbelief over. Why the success? How so quickly? Wicked Weed is one of the most innovative breweries in the country right now. Constantly pushing the boundaries with traditional approaches and new ingredients and combinations. With an eye towards creating a complete sensory experience, the label art, the look of the liquid, the nose, and ultimately the taste, take people lucky enough to try their beers through layer and layer of complexity. Just pour the beer into a glass and allow yourself to really experience the beer and you'll see a connection to the amazing art on the labels. It's all about the experience. Understanding that the beer is more than just a drink - it's a place in time, a memory, and ultimately an experience. Watch our conversation to learn about the past, the present and what the future holds for Wicked Weed from co-founder Luke Dickinson. Matt Lincecum - Founder Fremont Brewing Co.
Fremont Brewing Co., located in Seattle, Earth, is just one of those breweries that you love to support. In the product - balance, integrity, quality, local, purpose, and innovative are words that immediately come to mind. Yet, Fremont is more than great beer. Why? "Because beer matters." At Fremont, beer matters because (1) it makes the community better; (2) it provides great local jobs; and, (3) craft breweries engage and benefit the community as participants. They truly believe these things, but more importantly, they act on them wholeheartedly. Business decisions are made and beers are produced in accordance with the mantra. From providing all employees with full healthcare, to partnering with local farmers to create sustainable organic hops and quality grain, to cutting profits in order to provide the working class people that inhabit the surrounding neighborhood with a "fair drink at a fair price," Fremont literally and figuratively puts its money where its mouth is. Matt left his career as an attorney to follow his passion for craft beer after years of homebrewing. It's that passion that drives the quality of Fremont's beers and it's that passion that keeps them true to their core principles of being environmentally friendly, sustainable, and local. Fremont will grow into an 80,000 square foot facility by 2016 while maintaining the current 8,000 square foot facility for experimentation. Yet, they will lose none of their identity in this growth. They'll continue to forge the way in improving sustainable hops and grain farming to meet its needs and hopefully start a trend that spreads throughout the country. More importantly, they'll continue to produce world class beer all while making the community better and continuing their active participation in that same community. It's something to be proud of. It's something more should try to replicate. Because beer matters. We hope you enjoy and learn from this conversation as much as we did. Now, go find yourself a Fremont beer! Jesse Friedman - Founder/Brewer at Almanac Beer Co.
"We want to stand for something." It's the take away from the conversation. Almanac Beer, going in to it's fifth year stands for California, the idea that local is best, that quality supersedes quantity, and that beer is coming to knock wine off its throne in the kitchen. Using Northern California's local produce (sourced through collaborations with local farms) and a local house strain of yeast is allowing Almanac to provide a sense of terroir - a sense of place - the image of California popping up in your head when you look at, smell, and finally taste their beer. Still, what's most impressive is the way they truly view their beer as art. An expression of themselves. A look inside their soul. This is what craft beer needs to continue it's growth and sustain it's place in the market. Jesse, while proud of what Almanac has been able to produce - saying that his favorite Almanac beer is always the last one released - truly believes that it can always be better, that nothing will ever be at its best, and that he will never see the day when he can say that his beer is perfect. Not exactly the "big beer" marketing strategy but it speaks to the essence of this movement; that we are constantly meant to evolve, progress, and improve ourselves and what we do. This is what I love about craft beer and what I love about Almanac. Greg Rapp and Joe Scheibelhut - Rapp Brewing Co.
Rapp Brewing Company in Pinellas County, Florida, has made a name for itself by producing high-quality true to form old world styles. The Gose is highly acclaimed and the Munich Dunkel is right there with it. But they're also producing more modern takes on beer like their ever so popular Chocolate Peanut Butter Stout that tastes exactly like the name suggests. Fact is, whatever Rapp Brewing decides to put out is put out with such a strong emphasis on quality and attention to detail that you could literally point at any one of the 20 beers that are always available in the taproom and find yourself wanting more. Rapp Brewing is the kind of brewery that we love. Small, intimate, and friendly - ensuring that the people who enter find something that they like and have an experience that will lead to more visits with more friends. It's a responsibility that Greg and his head brewer Joe both are completely conscious of and embrace as they help push the Florida beer scene forward. Florida needs small artisan producers. The beer industry need Rapp Brewing.